June trip to Tobermory, Killarney, Tyson Lake Ontario. Left my Home strip near CYXU London , Ontario and pulled the Gear up. It stayed up until the return trip home 3 days later and nearly 9 flight hours with about 10 water Landings at various points of interest along the way. 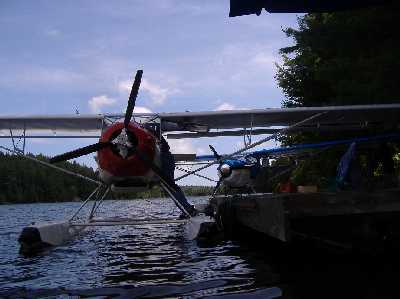 Our first stop just Derek and My self was for fuel at Tobermory harbour and to Wait for Gary to land there. Next Stop was Killarney for a fuel stop and get some Beer,Ice and Groceries. 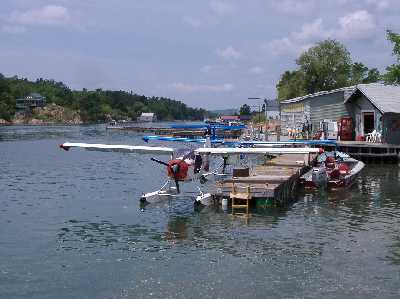 Nothing like pulling up to the dock at your cottage and having just 5 or 6 steps to the saunna - not to mention 120 C inside !! yah no place for the wimps…… Gary and Derek handled the heat ok. If too hot the lake is a great place to cool down although in Mid june the water was well over 75F — feels the same as our pool at home. Three of us flew in June 9, 2007 Tom was not home. I started this a while back but actually forgot about it .